1.Add a small piece of Dovecraft Perma-Fix tape to the inside of your empty tape roll. Attach the Dovecraft twine to the tape to securely hold it in place and begin to wrap the twine around the tape roll. 2.Continue to wrap your twine until you cover the entire roll. Once finished, use a small dab of Dovecraft clear ultimate glue to secure the last bit of twine to the roll. TIP: Use different coloured twine sections to get a boho feel to your Dreamcatcher. 3.Die cut the doily shape from the First Edition Doily die set onto glitter card. Adhere your die cut to the tape roll by threading twine through it. Maxine has thread through six of the holes along the edge of the die cut to secure it to the tape roll. 4.Turn your dreamcatcher over and add some Perma-Fix tape to the bottom of the roll to attach some lengths of Dovecraft ribbon and lace. Maxine has also threaded the lace through to the front of the dream catcher using the holes on the die cut, to add interest. 5.Add a few lengths of Dovecraft twine to the back of the tape roll with Perma-Fix tape. Attach a Santoro Willow peacock feather to the end of one of the strands of twine by wrapping the twine around the feather and tying it securely. Maxine has added three peacock feathers to her design but it’s up to you how many you add! 6.Cut out a few more lengths of Dovecraft twine and attach it to the back of your tape roll. Cut out a few feather shapes onto Dovecraft glitter card and stick your feathers to end of your twine with Perma-Fix tape. 7.Add a piece of twine to the top of your dreamcatcher and tie a hoop so you’re able to hang your dreamcatcher up. To achieve an alternative look, follow step 1 and wrap twine around the empty roll. Next, wrap the twine around the entire roll to create a wheel effect. 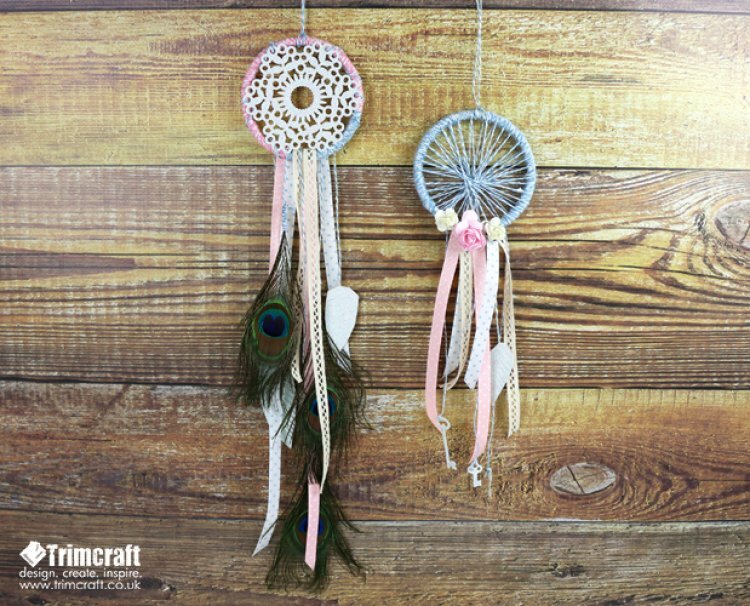 Add ribbon and decorative embellishments to your dreamcatcher by following step 3-6. We always encourage crafters to hold onto to any leftover bits and bobs, as you never know when they might come in handy for a beautiful upcycling project. This project is both easy and effective and would definitely make a gorgeous gift for a friend. How will you decorate your dreamcatcher? We would love to see your DIY upcycling projects so remember to keep adding them to the inspiration area. Don’t forget to #Trimcraft on social media when uploading your wonderful makes too!